Bio Link-09 is a exquisitely made versatile masterpiece and state-of-the-art from Star Link. The Bio Link-09 is actually a reduced version of Bio Star. The Bio Link-09 is very effective in managing attendance in small setup like IT firm, industries, or production units where the users are only less than 200. This device is featured with unmatchable features that makes it perfect in the field of access control and attendance management. Voice guided message confirms the acceptance and rejection of the punching. The Bio Link-09 features a recording capacity of 2 lacs records. The Bio Link-09 has multiple connectivity mode that allows the user to get the data easily without any hassle.The Bio Link-09 can store 600 finger templates making it more useful for small set-ups. It features a graphic LCD display that displays the message and voice guided message confirms the status of attendance. It also works on multiple operation mode. It can be customized according to the requirement of the client. Audio Indicator Voice Guided message (Adjustable volume) / Other language voice message (Optional at extra cost) / Customized voice greeting optional at extra cost. 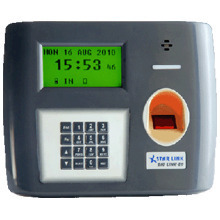 StarLink Communication Private Limited is one of the leading names, which specializes in manufacturing world class computerized Access & Attendance Recording systems, biometric access control system, biometric access control device, digital access control system and digital access control device. With micro-controller based digital system technology, we have extended our expertise in the arena of access control systems by designing and manufacturing several state of the art products. We provide total cost effective solutions that are highly efficient. Our specialization lies in the area of automatic data collection and then linking it with the main stream application by using our state-of-the-art technology. It helps in tracking records of the entry and exit timings of employees upto minutes level, Late Arrival/ Early Departure & OT calculation etc. Our latest infrastructural set-up and technical support team is a group of enthusiastic and professional engineers who keep themselves up to date with all the latest happenings in the technological field.